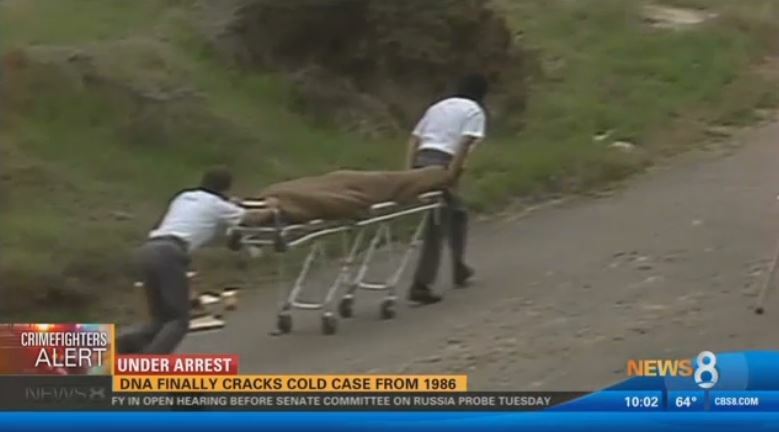 CBS 8 broadcast includes archival footage from the 1986 murder. A man was convicted of first-degree murder Tuesday in the October 1986 stabbing death of an acquaintance, whose body was discovered in a Lemon Grove field. Stacy Littleton, 53, faces 26 years to life in prison when he is sentenced Aug. 6 in the death of 20-year-old Cyrus Jefferson. Investigators initially determined that Littleton and Jefferson had been together on Oct. 11, 1986, driving around in the victim’s car. The car was found in East County, and Littleton was arrested on suspicion of killing Jefferson, but the District Attorney’s Office initially declined to file charges, citing insufficient evidence. At the urging of Jefferson’s sister, sheriff’s cold-case investigators reopened the case last year. A detective came across a black glove found near the victim’s arm and DNA testing not available in 1986 showed strong matches to both Littleton and Jefferson, leading to the defendant being re-booked on the murder charge. Defense attorney Jane Kinsey said Littleton had no motive to kill his friend.